David Anderson has a message about the world-class gardens his father, John, established in Rockford more than 30 years ago: Come on in and enjoy! Attracting more locals to the gardens is one reason AJG introduced a weekly “Tuesday Evening in the Gardens” concert series this summer. And folks have responded with gusto. The first performance, featuring musician Miles Nielsen, drew more than 500 people, far exceeding Anderson’s expectations. One of the best things about the concert series, so far, is the way it brings different kinds of people together, says Anderson. 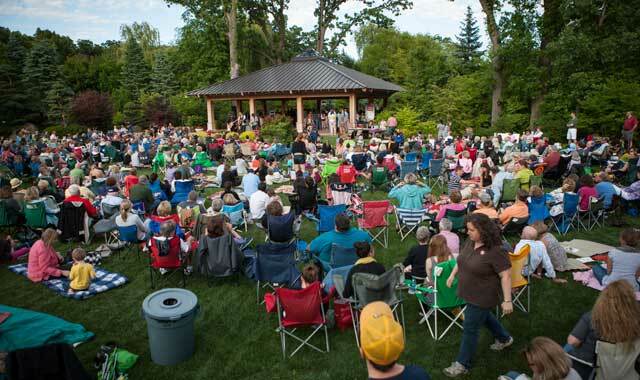 The concerts are staged Ravinia style: concert-goers bring their own lawn chairs or blankets, and can bring a picnic from home, or buy food from vendors like DiTullio’s Italian Market & Cafe, Woodfire Brick Oven Pizza, Zammuto’s or the Popcorn Parlor. Carry-in beverages aren’t allowed, but beer, wine, soda and bottled water are available for purchase. AJG allows its vendors to set up at no charge, in support of Rockford’s City Market initiative, an event in which local vendors set up in downtown Rockford each Friday night during summer. It’s also meant to be a kid-friendly and affordable evening. As the father of four children under age seven, Anderson knows how difficult it can be to find a good babysitter, especially on a weeknight. Concert admission is $5 for adults, and free to garden members. Guests can set up picnic areas on the lawn starting at 5:15 p.m.; musicians begin performing at 6:30 p.m. Overflow parking is at the University of Illinois College of Medicine on Parkview Avenue. Guests can walk to the gardens or catch a shuttle. Along with the concert series, AJG offers a monthly lecture series on topics of interest to gardeners. It also partners with individuals and organizations around the community to offer a long list of classes and special events for adults and children, such as adult watercolor painting, taught by Stella Dobbins; children’s programs conducted by Discovery Center Museum; and exercise classes led by Peak Fitness. Worship services are offered, too. “People can check our website or Facebook page to see everything that’s going on here,” says Anderson. And if activities aren’t your thing, it’s still fine to visit the gardens just to soak up the beauty and serenity that they offer. The gardens and gift shop are open seven days a week. This entry was posted on Thursday, July 26th, 2012 at 11:57 am	and is filed under Arts & Entertainment. You can follow any responses to this entry through the RSS 2.0 feed. Both comments and pings are currently closed.